For the BL! For justice! For Rainos!  Bodies stirred in a dim cavern (i.e, the picture is supposed to be black, for anyone who didn't get the joke the first time). Chain mail clinked but barely glimmered in the trickle of sunlight issuing from a crack. A figure who made up for almost-unhealthy slimness with a ridiculous mass of hair let out breath, and the meeting began. "It goes without saying that we need a plan of attack," Liza said. Surrounded by his veiled followers who could almost be taken for Mythronian soldiers, Father Leopold nodded. Cowton, the last town they had struck on their way to Meids had been an in-and-out job - they had confiscated the one drunken ranger's weapons and set two archers in the shack of a watch post. The only trouble they had encountered there was the smell, but this town was large enough to afford wooden walls and a garrison that wouldn't give up easily. "There aren't a lot of options here. I say we rush them, burn the walls, kill all who resist and take what we can. Our force is large enough to take a few losses." Steven looked at Yggan. As dark as it was, he could feel the Dragon gave him a faint smile back. "No need, miss. We already have the garrison in custody. Not a drop of blood on either side," he said. Near the Elvyniah, the peaceful town that would be the subject of a Black Lotus planning session the next day, sat the finest (and only) brewery for five miles in any direction. What exactly went on in a brewery, Steven didn't know - like everyone else from his village in the north of Rainos, he knew how to make mead and a number of fermented foods, but the production of Meidish drink, alias "starglimmer," was a mystery to him. Guaire, the wanderer who never used his real name, took in the building across the riverbank. "Quiet place. Maybe one, maybe six hands. We could storm it, but we'd be going in blind." "No thank you, Guaire. I'll try a softer approach first," Steven answered. A minute later he had crossed the bridge upstream and was riding up to the establishment on the aging demon-horse the grooms called Old Betsy. Taking care not to invoke the wrath of the nearly-senile monster, the knight dismounted and let her graze. 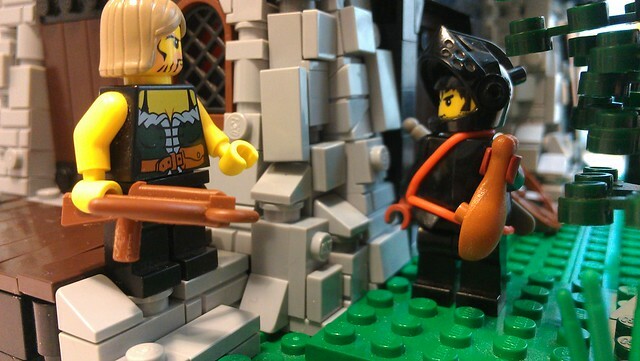 Steven looked up to see a hairy-faced man with a loaded crossbow. 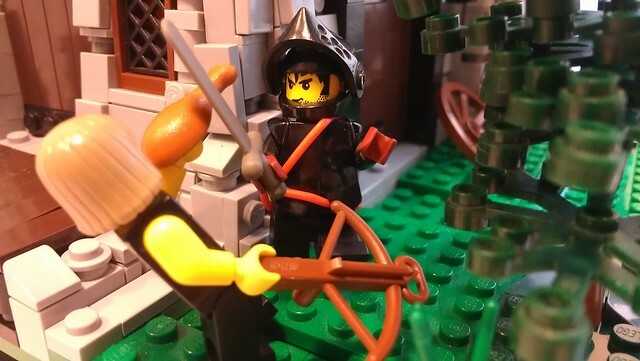 When he had been first inducted into Cedric the Bull's navy, Steven had been lectured on how a semi-decent crossbow cost more than an average soldier made in a year. It annoyed him that half the rednecks in Mythron seemed able to afford the luxury. "I would like some ale, please. And I intend to pay good coin for it." He jingled a purse, and the suspicious brewer came all the way out. "Roads aren't safe these days. Some sort of Dark Locus about, I hear." After recovering from the minor shock that the crossbowman was, in fact, a lady with remarkable facial foliage, Steven smiled and tossed the coin sack. 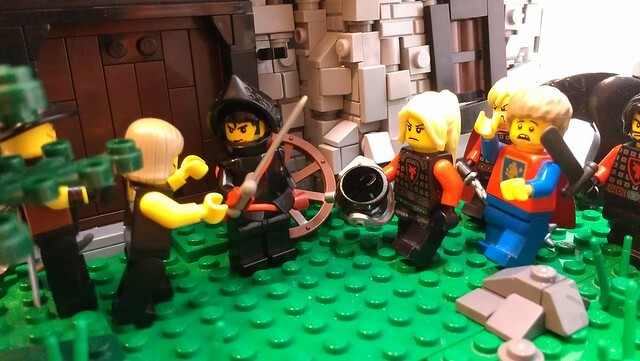 As the brewer reached for it, the knight stepped smartly forward, kicked the crossbow from her hand and drew his sword. "I'm afraid that you're right, ma'am. Now..."
An oath came from inside, followed by some crashing, the sound of a door opening and another oath. Dame Hardnail came around the back with her men and a second brewer. The lady with the coins swore worse than the other one and lunged for Steven, only to be restrained by the apparition of Guaire. 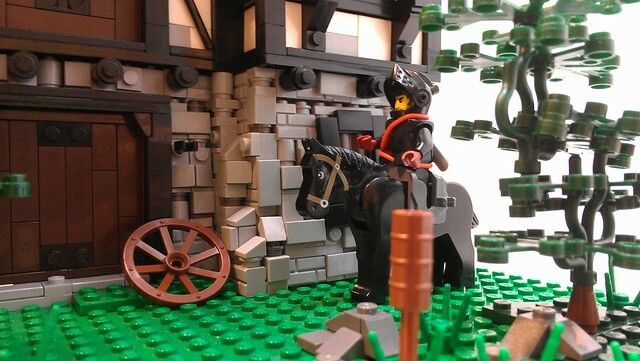 "I can see that these negotiations are going to go well," the Bull Knight sighed. "So, how did the negotiations go?" Father Leopold asked. "What's more, why bother to negotiate with these moonshiners in the first place?" Liza added. "I'll tell you," Steven promised. 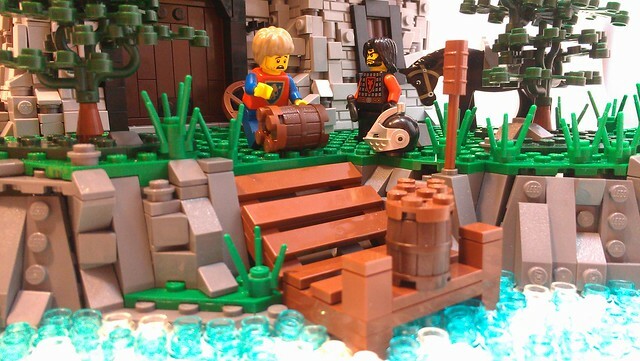 "When asked to betray their village, even with the coin we offered, the Brewers were reluctant to deal. 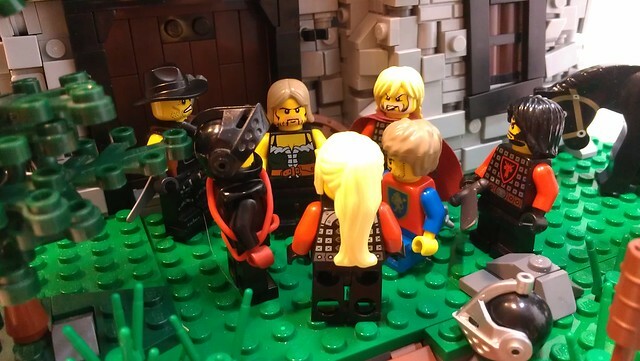 Then we explained the situation: that we are trying to liberate Mythron, put the corrupt nobility out of power, and, most importantly, liberate their town without killing the guards. Really, the Brewers would be heroes if they went along with us." "...and the scum of their village if they forced a slaughter," Yggan added. 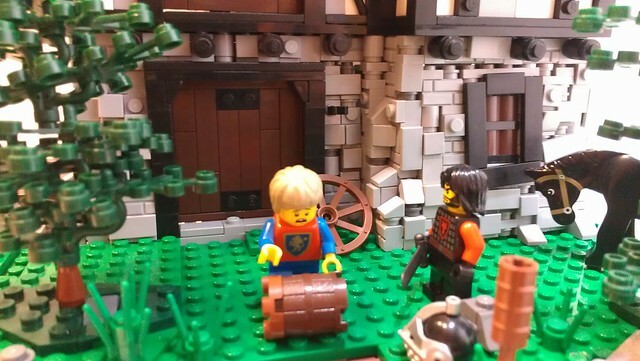 "Not an hour later, Billy Brewer rafted down to Elvyniah with his weekly delivery for the garrison. They drank up, and, thanks to some concoction Steven had from a witch in Falmore, the lot were soon too dizzy to raise the alarm when we marched up. A simple change of flags and rotation of defenders gave us the town," she finished. The rest of the Lotus' leaders were, of course, impressed. I don't have a lot of time for this, as I rushed this entire build, but I'll add a few important comments. The trees in the yard are made of seaweed and leaf elements. I'm not sure if the design is new, but my mom put one together out of the parts in my vegetable drawer and I decided to use the design. I also used some panel rockwork, and it wasn't as terrible an experience as I feared. Following the KISS principle helps with the gaps. 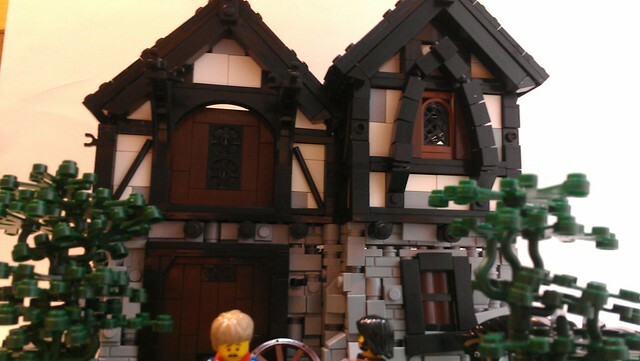 Finally, I had some inspiration from the work of Luke Watkins, the great medieval builder of our time, on the building. You can see the sloping, greebled walls and the use of black rather than brown framing as a result - when you think about it, that reddish-brown is kind of cartoony. That's it for now, except for this - wish Steven luck as he pushes on towards Meids! P.S. - Since this was a rush job as well as a strain on my pieces, I'll pass on the usual breakdown. Thanks anyway, Halhi and Kai! P.P.S. - Retraction of the P.S. - What the heck, go to town on this! I'm missing the commentary on all the flaws already - I feel kind of naked without it. Yes, I was venting there. It's so late it's early, and my eyes can't focus from exhaustion, so pardon me. Quoting Halhi 141 I suppose. Not really very personal though, more like just ranking up. The best part is the Liza and Bilbo romance. I suppose. Not really very personal though, more like just ranking up. The best part is the Liza and Bilbo romance. There was all that stuff about Steven changing from a lowly crossbowman into a knight, sea-captain and high-ranking commander. Oh, okay. :P It was the emperor of Leon (who ended up dying at the hands of the main villain). Quoting Kai Bernstein By the way, there's something I've wondered for a long time: Leopold - that doesn't by any chance happen to be a reference to Rise of the Mage, does it? No, not at all. I don't remember which character was named Leopold in Rise of the Mage. By the way, there's something I've wondered for a long time: Leopold - that doesn't by any chance happen to be a reference to Rise of the Mage, does it? I think dark brown worked great as an accent color. Black is not at all unrealistic, either. Quoting Gilbert Despathens Thanks for the wisdom. I now know how to hide the gap, after studying Luke Watkins' work some more, and you can be sure that I'll fix it in future MOCs. As why I used the headlight brick... why not? It only adds to the greebliness. 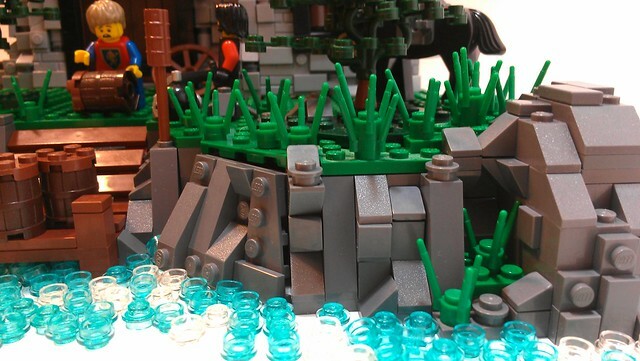 I'm glad you liked the rockwork, or at least approved of it - my Bricklink wishlist has a lot of dark stone grey on it for me to use someday, as well as some green plates. I'll match you in landscaping yet. Nicely Done! I quite enjoy the stonework and the overall layout of the MOC! Quoting David FNJ Wonderfully done! Great job on the building. I like the black rods for the angled beams. Nice angled portions on the building as well to make it more worn. Those rods were my favorite part. Thanks, FNJ! Quoting Kai Bernstein Oh, fun, a PPS. :P In that case... nice job on this! The layout is great. The rockwork would be just "decent", but the panels really take it up a notch - the flowing, seamless application of them fits in nicely. The little dock is really nice as well; I like the sloping section of it. The ground could definitely use more layering, but I understand piece constraints (though in that case, bits of dark tan would be nice; realistic layering is subordinate to aesthetics. :P) That tree is brilliant, if unnatural; your mom came up with a great design. Now for the buildings. The stonework is overall very nice, though I see an exposed stud socket on a headlight brick to the right of the door. Why not just use a standard 1x1 brick? I'm not sure the slope of the wall works out; it's a bit too subtle to make up for the stud-lined gap at the top. The second floors of the buildings are the real detractor, though. The excessive arch stuff around the windows just looks weird and out of place, though I understand the buildings would have looked boring otherwise. Still, you might have used some other techniques. I do like the roof design, though. So all in all, it's a good build but more refined buildings and some layering - plus better lighting - would have helped immeasurably. Thanks for the wisdom. I now know how to hide the gap, after studying Luke Watkins' work some more, and you can be sure that I'll fix it in future MOCs. As why I used the headlight brick... why not? It only adds to the greebliness. 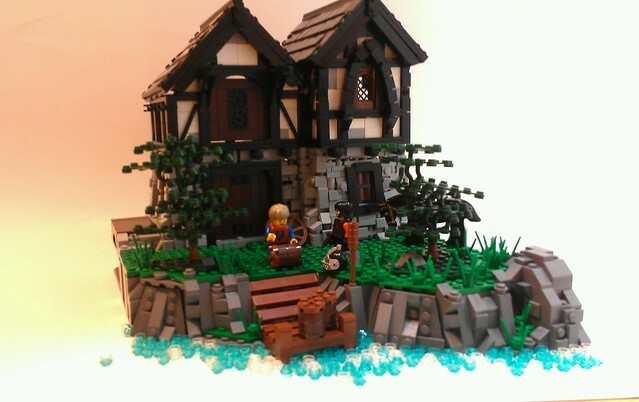 I'm glad you liked the rockwork, or at least approved of it - my Bricklink wishlist has a lot of dark stone grey on it for me to use someday, as well as some green plates. I'll match you in landscaping yet. Goin' all David Henselish on us, huh? :P Great work! Oh, fun, a PPS. :P In that case... nice job on this! The layout is great. The rockwork would be just "decent", but the panels really take it up a notch - the flowing, seamless application of them fits in nicely. The little dock is really nice as well; I like the sloping section of it. The ground could definitely use more layering, but I understand piece constraints (though in that case, bits of dark tan would be nice; realistic layering is subordinate to aesthetics. :P) That tree is brilliant, if unnatural; your mom came up with a great design. Now for the buildings. The stonework is overall very nice, though I see an exposed stud socket on a headlight brick to the right of the door. 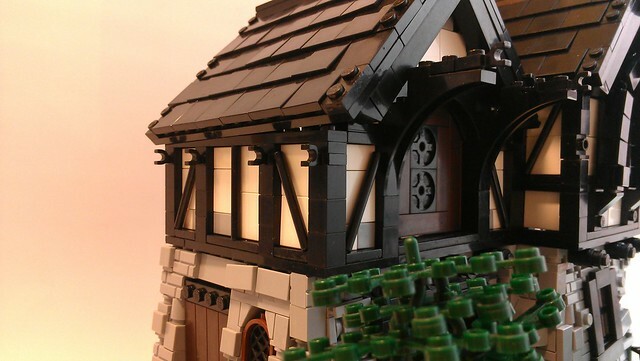 Why not just use a standard 1x1 brick? I'm not sure the slope of the wall works out; it's a bit too subtle to make up for the stud-lined gap at the top. The second floors of the buildings are the real detractor, though. The excessive arch stuff around the windows just looks weird and out of place, though I understand the buildings would have looked boring otherwise. Still, you might have used some other techniques. I do like the roof design, though. So all in all, it's a good build but more refined buildings and some layering - plus better lighting - would have helped immeasurably. Nice building! Cool build too! Beautiful building. SO many great textures and details. Nice pics too. Wonderfully done! Great job on the building. I like the black rods for the angled beams. Nice angled portions on the building as well to make it more worn. Wow - one of my favorite creations as of late! I love the stone work and rockwork. Nice! 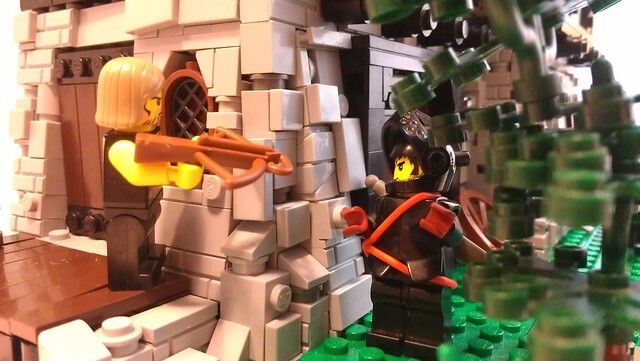 Excellent MOC! Textures on the building are awesome, as is the rockwork. Love the angled walls. Too bad you don't have any more green plates. Awesome job! Love the stone-work on the building. But the hairy bearded crossbow guy has a female torso. Awkward... The build itself is really good, though! Nice work! The angles on the first floor of the house are excellent, and the stonework is well-detailed. Also, the seaweed trees look better than I expected. The panel rockwork, too, is satisfactory. I think this is actually rather nice- the slopes in the house are what saves this one. I can give you a list of excuses. Flat, green ground? I don't have any parts for a more-layered or different-colored terrain - what you see is what I've got. The same goes for the rockwork - I simply don't have any more. Now I can start going into time: If I'd started pushing this a day sooner, I would have worked on unusual second-floor angles, less gaps and a different daub technique, because I'm getting a little tired of the current one, too, which I use for ease and parts availability more than anything else. I'm not sure what you mean about the "gaps around the windows," though, so I can't answer you there. Overall, both of us have put out some amazing MOCs, and even when we pass them there will still be flaws. At least we have more time to do it over this month, right? Why must people complicate the thing I hold very dear?!?! D: People start creating flimsy, (but granted, cool :P ) techniques, and everything just has to be so perfect! (and piece consuming!) This build is wonderful, and I see very little flaws. (aside the unnecessarily complex techniques. Just when I was getting good! D:< ) Well done, Gilbert. The stonework and trees are both very nice, but the rest seems very inconsistent to me. This is one instance where green ground just doesn't work - a darker color like sand green, brown, or sand green would look better. Also, the dilapidation is a bit inconsistent - the stone walls are very greebly, and there's a few bent planks on that lower half, but the top bit isn't dilapidated at all. Other than that, the water and rocks are bothering me - the water is too bright, and the rocks are a bit undertextured (more texture would fit the style of the building) and awkwardly shaped in some places. By the way, gaps aren't a bad thing necessarily, or at least not as bad as you seem to think - I'd rather have good shaping and good technique with some very minor gaps rather than blandish shaping and techniques with no gaps. My one last critique is that I've never liked your method of texturing with the SNOTted (white) walls - it looks a bit too blocky. 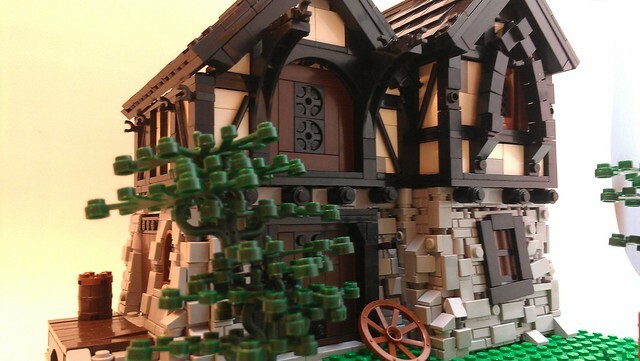 Overall, this is a pretty good build and your best small exterior by far, but it seems lacking compared to what you've done in the past - you know that last October set your standards and I'm not convinced that you've exceeded them since then...anyway, I've rambled on long enough, good luck. Wow! This looks great, Gilbert! I really like your stonework! It looks amazing! The usual breakdown won't have a lot in it with this one Gilbert... you did a fantastic job. I love all of it, especially the slanted wall... Great work!